(Click photo to enlarge)Back in 2005, we posted about the artwork for Neil Young's "GIVE TO THE WIND" album, which eventually became Comes A Time. We're proud to offer here one of only two known examples of the album cover proof for Neil Young's unreleased Give to The Wind (see more about this album below). 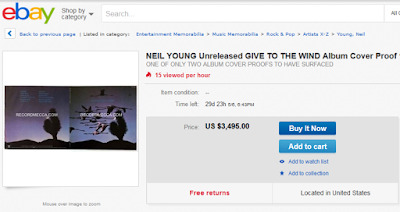 The only other example to surface was offered on Ebay in 2005, and it’s believed it was purchased on behalf of Neil Young, for his archive. 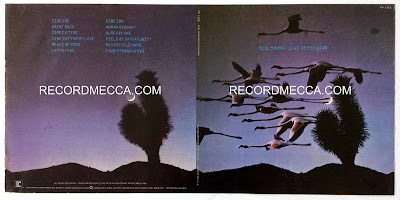 We acquired this from a former Warner Bros. Records executive who saved it after the album title and lineup was changed. It measures 25” x 12 ¼” and is printed on album cover stock. Typically a small number of album cover proofs were printed for artist, management and label approval before finished LP covers were printed. In this case, Warner/Reprise must have called back the proofs that were printed, as only this example and the one mentioned above have ever surfaced. This example is in excellent condition, with toning to the back (from being in a frame backed by non-archival cardboard), and some very minor fraying to the left edge (it looks as if some minor moisture got into the left edge of the frame, causing some very minor paper loss to the bottom left edge, on the back only.) Overall it looks great, as you can see from the scans below. We have watermarked the scans, but the proof is of course unmarked. In 1978 Neil Young released the seminal LP: 'Comes a Time'. For a while prior to its release this album was known as 'Give to the wind'. A second test pressing of 'Give to the Wind' was subsequently issued - some with normal stock copy labels (as opposed to plain white with a photocopy A4 sheet). Soon after another batch of test pressings were issued with the name changed to 'Comes a time'. The story of this records release doesn't end there at all, it goes on to include Neil putting a .22 caliber bullet through each box of the initial pressing & more test pressings & a change in running order - but this is another story for another day. The point is that 'Give to the Wind' was never issued in its original form. Some test pressings have shown up & some with stock copy labels. However what is not largely known is that at some point Warner Bros artwork dept prepared a provisional cover design for this LP which was never to be released. Hurry up and get your bid in now! Bids are already at $3,495?! I'm usually really into these kinds of things, though this is a lot less interesting to me given that the track list isn't any different from 'Comes A Time'. Really cool to see this! How crazy can one get?! Whoa, that's cool to see. 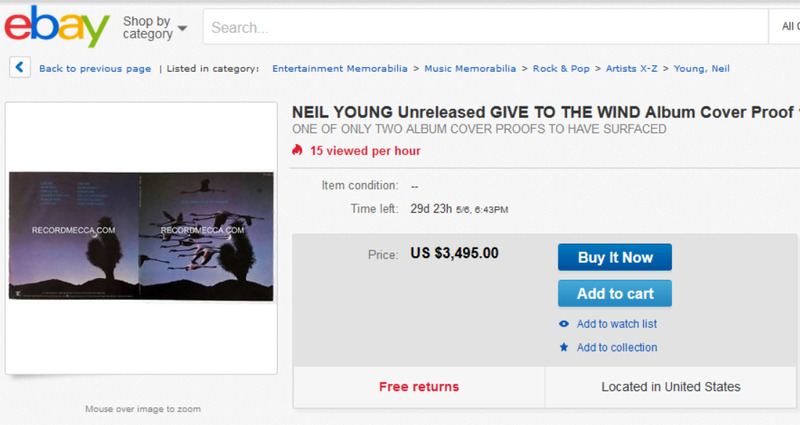 There are no bids, it's "buy it now" for that price, which seems kinda high IMO.... Maybe if there was a test press of the LP included. Still, pretty neat. Thanks for sharing, Thrasher!